slender delta is repaired. The nose was quite a bit more torn up than I thought on first look. It it came back together nicely with a little hot glue. I will post pics of the new cg. The old cg is visible in the main challenge thread.It would not fly with the first cg, it was too far back. I brought it too far forward by setting the battery as far forward as possible and that was a flop. Right about where I have it now got it to start flying, but anemically. The prop cap was a little loose too. I added 56% negative expo. I'm not using dual rates because the elevons don't have much down travel to begin with. I will try when I get a chance with the new cg and expo settings and see if I can get it to fly right. I can now steer the plane with the expo! Sadly, it flies low, slow, and anemic where my prototype with the A pack could climb very well. This one just cannot seem to gain altitude right, and seems more than just s cg issue. I'll have to look into it I I know my motor is powerful enough, maybe my prop isn't aggressive enough? This motor said 5x3 would work but maybe that's more for quads, maybe a 5.5x5 racing style or three blade? Get some video, as if there is no video evidence, then too bad. It helps us help you if you need it, or laugh with you at the failures. I'll see what I can do to upload the sparse footage I have of the slender delta. It always tells me the file is too large when I try to post a video. Recording and sharing my videos is also something new for me to learn. I'm far from a whiz at these things. Other than that I may have a couple people who would be able to film my flights and send me the video. I am also heavily considering a small sports cam to mount to a hat or onboard. Again, I would have to learn to format the video properly to post it here, or maybe create a YouTube channel. Requested to change build 4 to nutball. Saving DR1 for a proper F pack. Shopping for supplies. Need fresh foamboard and blades and skewers. May check for a phone tripod too, otherwise I'll order one. I'm actually really looking forward to building another nutball, because I can fix pretty much everything that sucked about the first one I built. There are many varying methods for fuselage construction on these, I got one of my own design in mind that's sturdy, clean with nothing hanging out, super easy access to electronics, and derp simple to build. 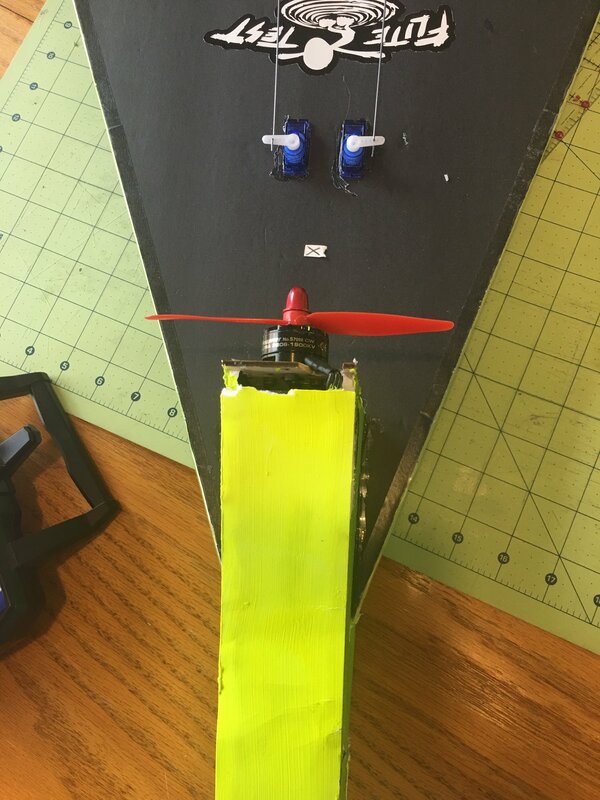 My first nutball didn't have much of a fuselage, just a motor mount and taped down electronics. I learned lazy building habits from YouTube where people with much more experience than me toss up a piece of slop with taped down electronics they built in 30 minutes and it flies great. Now I've started to develop a building style of my own based heavily on FT techniques, and it's just so much more functional and aesthetically pleasing. Cleaning up my posts and adding info over the next couple days. My nutball is done and is awaiting my camera tomorrow along with my scout so I can try to get maiden footage. I will possibly even be able to get in a quick rebuild of the slender delta before the deadline, because I built that type of plane so many times testing and it's a very quick and easy build. I got my info straight on thrust angles now which is the main thing that killed the last one. Any luck on the maidens @Vimana89 ? Only the re maiden of scout. I'll have to make a YouTube account and upload when I get a chance hopefully today. The others were aweful. Winds and a rushed build destroyed the rebuild slender delta. My nutball motor inexplicably crapped and started stuttering before takeoff and hasn't been right since. I can commeserate. So all of them were heaved into the air sounds like. Don't pull a FoamyDM and be discouraged. The Kolibri was like a waggling sign-post in a strong wind. I need to finish up my thread information. I'm pretty bummed out though. I'm sitting with a decent scout with a busted wing, a nutball and according power pack that won't even run, an old a pack and some scraps, a totaled delta, a couple crappy warped foam board sheets and no hot glue. The wind just won't let up for more than the third day in a row. I don't even know where to start from here. I learned a lot but spread myself very thin with this contest. I want to get something really running well. Chin-up. Now that this challenge is complete, relax, and rebuild the scout wing (mm or regular?) use tape if you have to, and try again. get some Glue and make a MM scout. 1 sheet. A pack, and everyone loves it. Either way don't lose heart. (says the guy who considered quitting yesterday.) my point is, don't Dispare, take a breath, pick one of these and get some success. Thread updated with all info. I can't promise anything but will try to get the crumby bit of scout re-maiden footage up by making a YouTube account. The home made firewalls I proposed earlier in this thread seem to be unreliable in a tractor configuration and dirty the drillbits with hot glue. I may be onto something but they may not end up being very effective. I probably don't plan on using these again any time soon, but if anyone else still wants to test them further go right ahead.